Vanguard Sonics: Mobile Fidelity Reissue Presents The 1958 Standard with Unparalleled Sound Quality! This Masterwork is Oft-Overlooked Link Between 'Round About Midnight and Kind of Blue. In MONO—You Will Not Hear a Better Analog Edition! Only Record to Feature Davis’ Original Sextet, Including Rhythm Section of Paul Chambers and Philly Joe Jones. Title Track Stands as First-Ever Modal Composition Even as Blues and Hard-Bop Flavors Make LP One of Davis’ Most Explosive Affairs. Miles Davis created just one studio album with his original sextet. He made every moment count. Pairing with Cannonball Adderley, John Coltrane, Red Garland, Paul Chambers, and Philly Joe Jones, the trumpeter not only laid the groundwork for the modalism that immediately followed but tailored a genuine modern-jazz masterwork laden with performances among the most explosive of his distinguished career. 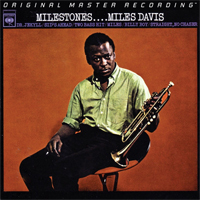 Due to its sandwiched position between the more famous ‘Round About Midnight and epochal Kind of Blue, Milestones remains, for too many music lovers, an overlooked classic. Part of Mobile Fidelity’s Miles Davis catalog restoration series, Milestones has been restored to mono for the first time as to expose the record’s standing as one of the all-time great jazz efforts.Mastered from the original master tapes and pressed at RTI, this unsurpassed 180g mono LP edition grants each musician their own space in a well-defined, broadened soundstage. Colors, shapes, and dimensions appear in the manner they do when beheld from behind a studio-control room’s window. Davis’ burnished trumpet? Rendered in three-dimensional perspective, coaxing his mates out to play with unburdened zest and commotion. Coltrane’s trademark saxophone? Witness it in life-size proportion, his solos working in tandem with and against the driving rhythms. Garland’s swaggering piano lines? Visualize the 88 keys as he hits full stride, the chords and fills slithering around skeletal frameworks. If anything, Milestones is as famous for its title track as the players that produced it. The launching pad for many of Davis’ (and later, his contemporaries’) improvisational flights, the singular piece invites the tessellated explorations Coltrane would forever chase as well as the headliner’s argyle solo work, who broaches territories that far exceed what he had done with his bop-rooted past. Every song is a highlight, whether it’s the bravado “No Jackle,” featuring a hot-foot pace and bebop strains, or “Sid’s Ahead,” which continues the album’s blues theme while tossing around edgy harmonics and inside-out structures. Then there’s “Straight, No Chaser,” the absolutely definitive rendition of Thelonious Monk’s signature piece. Coltrane’s marbled playing pulls at the tune’s lobed borders, Adderley takes liberty with solos, and Davis dances around his mates, at one point quoting “When the Saints Go Marching In” while demonstrating his knowledge of tradition and eye towards the future. A milestone if there ever was. And now, in resplendent mono.